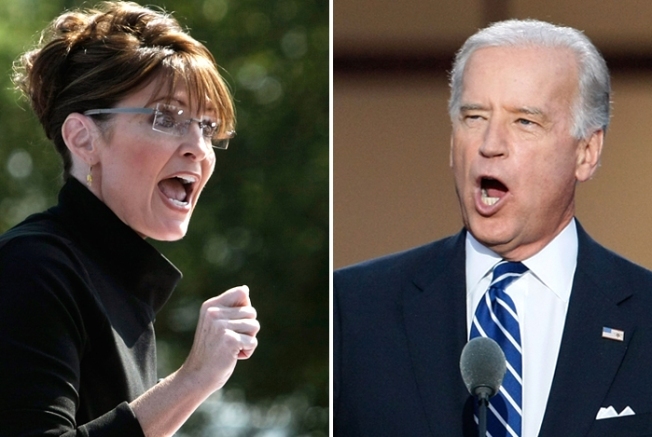 Joe Biden vs. Sarah Palin, Oct. 2, Washington University in St. Louis. ST. LOUIS –– Republican vice presidential candidate Sarah Palin accused Barack Obama of voting against funding for U.S. troops in combat Thursday night in their much-anticipated campaign debate and chastised Obama's Democratic running mate, Joe Biden, for defending the move, "especially with your son in the National Guard" and headed for Iraq. "John McCain voted against funding for the troops," as well, Biden countered, adding that the Republican presidential candidate had been "dead wrong on the fundamental issues relating to the conduct of the war." Biden did not reply to Palin's mention of his son, Beau, the Delaware attorney general, who is scheduled to fly to Iraq with his National Guard unit on Friday. Palin has a young son who is in Iraq with the Alaska National Guard, although she did not refer to it. The exchange over Iraq was easily the most personal, and among the most pointed, as the two running mates debated across 90 minutes on a stage at Washington University. They also clashed over energy, the economy, global warming and more in their only debate, with little more than one month remaining in the campaign and McCain struggling to regain his footing. Republican officials disclosed earlier in the day that he was conceding the battleground state of Michigan to Obama. The state voted Democratic four years ago, but McCain had spent millions trying to place it in his column.